Author’s Note: When I wrote this piece in the wake of Senator McGovern’s death in October of 2012, I must admit that I was fairly pessimistic about the future of the progressive wing of the Democratic Party. McGovern was for me, like many in my generation as well as my parent’s generation, the epitome of what a conscientious, principled and passionate public servant should be—one of the very few American politicians who, as Chris Hedges put it, never sold his soul. Just two and a half weeks after his passing, Elizabeth Warren was elected as Massachusetts’s first female Senator and a new best hope of Democratic Progressivism was born. It remains to be seen if Warren will run for The White House and, if she does, whether or not her populist convictions can remain intact in a post-Citizens United political landscape, but I can say unequivocally that I’d rather have her emulate McGovern’s devotion to the poor and disenfranchised—in America and abroad—than the third way capitulations of his successors. George McGovern, the one time Democratic nominee for the Presidency of the United States and a politician once described by Robert F. Kennedy as, “the only decent man in the senate”, left us nearly two and a half years ago, passing away in his home state of South Dakota at the age of 90. In Mr. McGovern’s death we lost a man who was not only the standard bearer for the American populist experiment, but the last big-ticket advocate it had left. His failed presidential campaign in 1972 represents the high-water mark for progressivism in mainstream American politics and serves as a lodestar for liberal Democrats to this day. 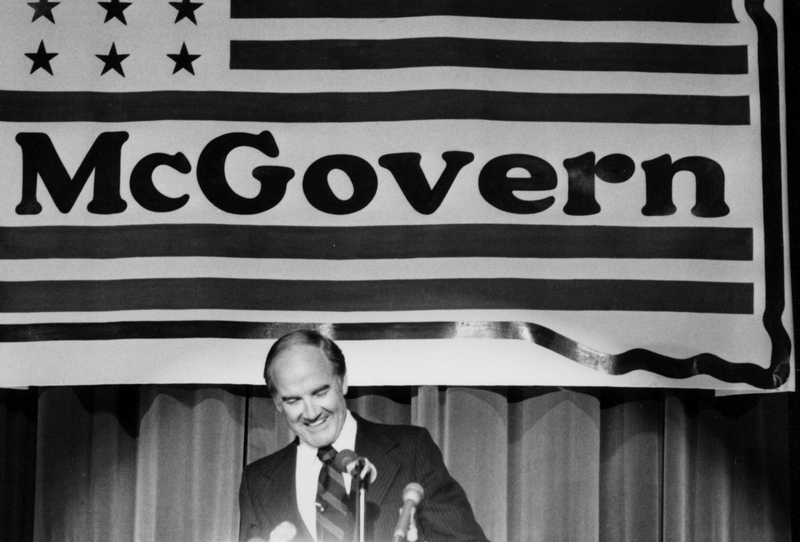 For all of his faults, George McGovern was the political manifestation of our best selves; a man who fought for peace, waged war against hunger and brought the Democratic Party out of the darkness and into the light, if only for a moment. The details of McGovern’s early life sound like the backstory to some lost F. Scott Fitzgerald short story. Born in the tiny town of Avon, South Dakota, McGovern moved to the comparative metropolis of Mitchell, SD at the age of 6 where he was raised by his mother and his stern Wesleyan Methodist pastor of a father who forbade him from indulging in such innocent activities as going to moving picture shows (he did anyway). McGovern ended up going to college in Mitchell, attending Dakota Wesleyan University for two years before joining the US Air Force after Pearl Harbor and the start of American involvement in World War II. While at Dakota Wesleyan, he met his future wife Eleanor Stageberg, getting married before being deployed to Europe to fly B-24 Liberator bombers over Italy, Germany and Austria. All in all, McGovern piloted his quota of 35 missions, receiving the Distinguished Flying Cross for crash landing a wounded bomber on a small island in the Adriatic Sea, saving his own life and those of his crew. McGovern never talked about his experiences in the war on the campaign trail, even though those experiences would have done much to dispel the popular notion that he was a cowardly pacifist. But, as was the case with many men of his generation, the war was simply something that he didn’t talk about. When asked in his later years why he didn’t emphasize his war record more, McGovern admitted that it wasn’t politically savvy, but said, “I always felt kind of foolish talking about my war record—what a hero I was. How do you do that?”After a brief stint as a history professor at his alma matter, McGovern took a job as executive secretary for the South Dakota Democratic Party and parleyed his experience canvassing the state into a seat in congress in 1956. 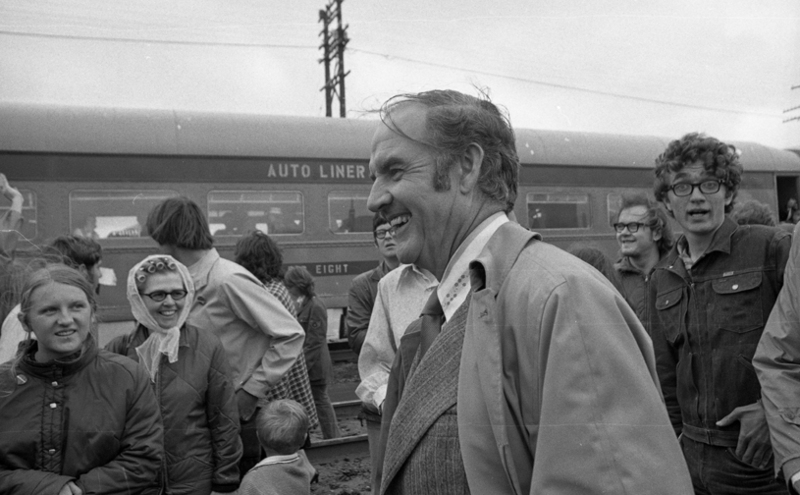 McGovern was a man who was built for the politics of the prairie. With a long history of populist movements centering around the rights of local farmers, McGovern’s brand of agriculturally conscious, pro-union liberalism played well in a state that tended then and now to be Republican at its core. McGovern remembered growing up in Mitchell during the lean years, when the Great Depression was at its worst and the Dust Bowl was roaring through all the plains states, and never forgot what it felt like to truly know want and to scrape by on the precipice of poverty. Through his experiences during the Great Depression and his Wesleyan Methodist upbringing, McGovern evolved into a champion for the poor and the vulnerable in America and abroad, arguably becoming the most tireless advocate in the fight against hunger of anyone in his generation. After losing a bid for the Senate in 1960, President Kennedy appointed McGovern as the first director of his Food for Peace program, where he was instrumental in feeding tens of millions of people across the globe. In his later years, he would be appointed ambassador to the United Nations’ Food and Agriculture Organization by President Clinton and eventually received the Presidential Medal of Freedom for his work. What Mr. McGovern is most known for, outside of losing the 1972 election in spectacular fashion, is his vigorous condemnation of US involvement in the Vietnam War. In 1963, the newly elected senator was the first man to openly challenge the wisdom of the War in Vietnam on the Senate floor. Although he would later vote for the Tonkin Gulf Resolution that gave President Johnson the green light for war, McGovern was almost immediately at the forefront of the anti-war movement in Congress and was considered one of the preeminent Doves in the Senate at the time. Over the coming years his anti-war rhetoric escalated and, after the sea change that occurred at the 1968 Democratic National Convention in Chicago, McGovern found himself squarely on the left side of the tracks as the face of progressivism in the Democratic Party. In 1972, George McGovern ran on a platform that would be unthinkable today and, some will argue, was unthinkable then. Not only did he want to get us out of Vietnam immediately, the Senator from South Dakota wanted to reduce defense spending by 37% during his first term in office and abolish the draft. The old dig against him went that a vote for McGovern is a vote for Acid, Amnesty & Abortion, and on two of those counts his detractors were spot on. While Mr. McGovern wouldn’t know what acid looks like if his life depended on it, he was an staunch supporter of women’s rights and he ran on the promise that all Americans who had dodged the draft during the Vietnam War would receive amnesty after he had taken office and the war was over. His was a campaign of two very distinct halves. The first half saw McGovern go from a 50-to-1 long shot amongst a field of experienced old party boys like Ed Muskie and Hubert Humphrey, to the Democratic nominee for president in the span of a couple months. It is still the gold standard of grassroots Presidential campaigns and the way that McGovern and campaign manager Gary Hart mobilized the youth vote and united the Democratic left has never been duplicated. A large portion of President Obama’s overwhelmingly successful 2008 campaign was based on the tenants and practices of McGovern’s primary campaigning. McGovern soldiered on through another term in congress before finally being one of the first casualties of the Reagan Revolution in 1980. From that point forward he continued to carry the flame of liberal causes, writing and lecturing extensively on the issues that he had made his name on and for which he cared most. McGovern was named the first United Nations Global Ambassador on World Hunger in 2001 and was an outspoken critic of the wars in Afghanistan & Iraq. He also became an unexpected voice in the fight against alcoholism and addiction after his daughter Terry died suddenly in 1994, freezing to death after having passed out in a snowbank at the end of a night of drinking. To cope with the loss, McGovern wrote a book on the subject, “Terry: My Daughter’s Life-and-Death Struggle With Alcoholism” along with helping create a treatment center in her name in Madison, WI. In July of this year, McGovern’s son Stephen also died from complications related to alcoholism. There’s an old line about The Velvet Underground that has it that, while they may have only sold a few thousand records, everybody who bought one ended up starting their own band. I think George McGovern’s life will be remembered in the same way. He may have lost in a landslide in 1972, but everyone who went with him on that journey ended up taking the message with them wherever they went. For instance, I’m only 28 years old. By the time I was born, Reagan was well into his second term and George McGovern was all but removed from the public consciousness. Yet, somehow, this man has left a larger mark on my beliefs and dreams than any other American politician I can think of. Like so many others of my generation, I discovered George McGovern for myself and, after finding him, realized how much I had missed him. He was the last presidential candidate we’ve had who stood out on the edge with his beliefs and had the courage to fail for the truth. He was the winningest loser I’ve ever known.